Bedminster, Bernards Township, Bernardsville, Far Hills, Peapack & Gladstone History that you might not know. 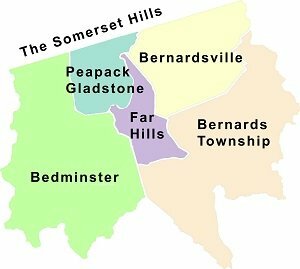 1921 – Far Hills was actually part of Bernards Township until seceding in 1921. Rising taxes led the 200 residents of Far Hills to decide to separate from Bernards Township and to incorporate as a Borough. The local property tax rate jumped from $2.72 in 1919 to $3.53 in 1920. 1717 – The original Bernards Township (Bernardston) area (3,000 acres) was purchased by John Harrison, agent of King James III of England, from the Lenape Indians in 1717 for only $50. That’s only 1.6 cents per acre! 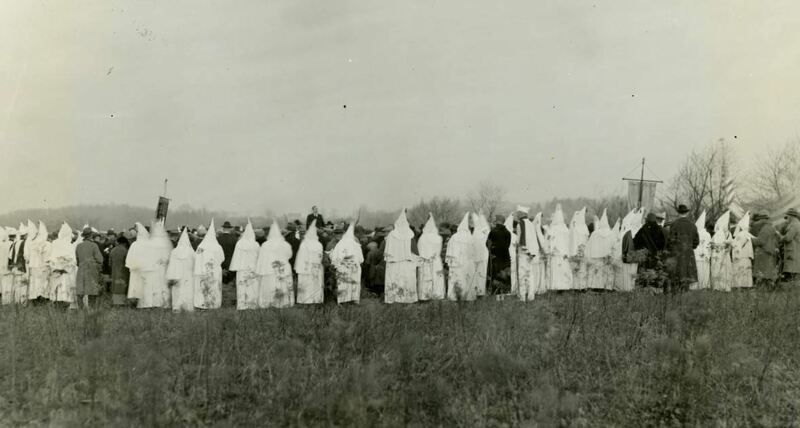 1840 – Did you know that Bernardsville was called Vealtown until 1840? There is still discrepancy as to whether the name is of family origin, or because of a cattle slaughterhouse in the township. 1880 – The 1880 Federal Census listed Bernards Township as having a population of 2,622 which included 218 farms. 1701 – What is now the Borough of Peapack-Gladstone originally was part of a large tract of land that Dr. John Johnstone and George Willocks purchased in 1701 from Dutch proprietors. 1760 – Both Bernards Township (Basking Ridge, Lyons, Liberty Corner) and Bernardsville’s namesake came from Sir Francis Bernard, the New Jersey governor from 1758 to 1760. 1760 – In addition to Bernards Township and Bernardsville, The plan for Bernardston, Massachusetts (Incorporated in 1762) was laid out during the administration of Sir Francis Bernard and is named for him as well. 1856 – William Lewis Dayton – Basking Ridge distant relative of Jonathan Dayton, almost became Abraham Lincoln’s Vice Presidential nominee. 1959 – George Ludlow Lee Sr, chairman of the Red Devil Tool Company of Newark, donated 60 acres of land for the Cedar Hill and Ridge High Schools and 12 acres of land for the War Memorial Field. 1722 – John Annin, officially know as John Johnston of Annandale, Scotland, arrives in Bernards and took title to 1,000 acres. The settlement was known as Annin’s Corner until the Revolution, when the name is changed to Liberty Corner. 1928 – South Maple Avenue in the Basking Ridge section of Bernards Twp was one of the first concrete paved streets in New Jersey. 1912- On June 6, 1912 Peapack and Gladstone set off from Bedminster Township and incorporates as an independent twin borough. 1832 – The Lenape Indians accept $2,000 from the white settlers for relinquishing their remaining hunting and fishing rights to Somerset County. 1806 – Warren Township is formed, separating from Bernards and Bridgewater Townships. 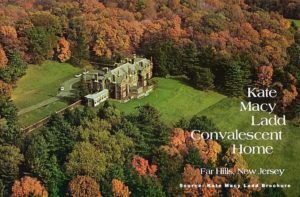 1988 – The Basking Ridge Historical Society changed its name to the Historical Society of The Somerset Hills to broaden its historical endeavors in Far Hills, Bedminster, Bernardsville, Bernards Township, and Peapack Gladstone. 1749 – Did you know that the Township of Bedminster, Chartered on April 4, 1749 in the name of King George II, includes the historic villages of Burnt Mill, Vliettown, Pluckemin, Lamington, Pottersville, Greater Crossroads, and Bedminster districts. 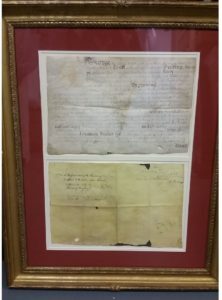 Did you know that the original document chartering the Township of Bedminster, is owned by the Forbes Family of Bedminster. 1760 – What is now know as Somerset County was originally a combination of three units of the Northern Precinct of Somerset County – Bridgewater (chartered 1749), Bedminster (chartered 1749), and Bernards (chartered 1760). 1972 – Routes 78 and Routes 287 were completed in 1972, linking the Somerset Hills with the rest of the state. 1905 – Did you know that the Bernardsville News offices in Bernardsville are actually part of the original Bernardsville Train Station, which was relocated in 1905. 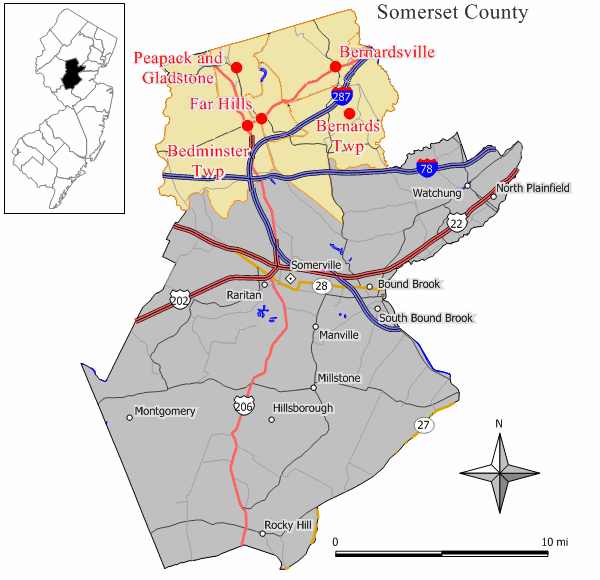 The Somerset Hills is a region of within Northern Somerset County containing Bernardsville Borough, Bedminster Township, Bernards Township, Far Hills Borough, and the Twin Boroughs of Peapack Gladstone. 1923 – The Friends of the Oak Tree was organized in 1923 to save the 600 year old oak tree in the Basking Ridge Presbyterian Churchyard. The tree trunk was cleaned of its disease, leaving space for four men to stand in its trunk. Three tons of Concrete were poured into the cavity. 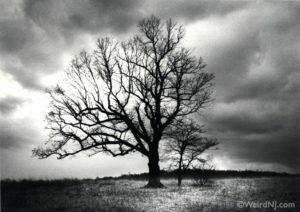 The Basking Ridge famous Oak tree, a landmark for centuries, is Bernards Township’s logo; two oak leaves, representing the villages of Basking Ridge and Liberty Corner. 1797 – Bernardstan Township in Somerset County had 2,377 inhabitants and 93 slaves, according to records of the American Gazetteer. 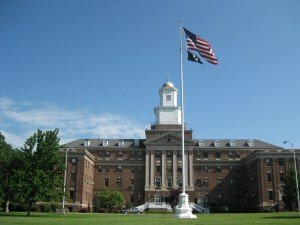 1930 – July – The Veterans Administration Hospital was dedicated at Lyons in Bernards Township, and soon began receiving its first veteran patients. 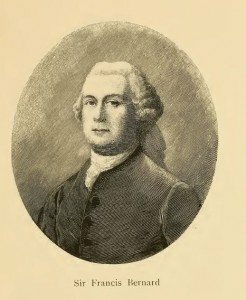 1782 – November – Did you know that Elias Boudinot, resident of the first Continental Congress was a Basking Ridge resident? Boudinot’s daughter, Susan, became the bride of George Washington’s attorney general, William Bradford. 2004 – Portions of the 2004 film The Stepford Wives was filmed in Bedminster (Lamington). 1895 – Clinton Ledyard Blair (Owner of The Blairsden Estate in Peapack) decides with other local developers to dam the Raritan River, creating Ravine Lake. Did you know he bought the surrounding land for only $80 per acre. 1910 – T. Leonard Hill, son of Garner Ferris Hill, in 1910, was one of Peapack’s first automobile owners, creating the first auto taxi in the Garner Hill Livery Service. 1931 – January 6 – The first electric train (3,000 volts of Direct Current) runs on the Delaware Branch of the Lackawanna Railroad. T. Leonard Hill of Peapack was on that train from Hoboken to Bernardsville. 1890 – April, Grant Schley (rhymes with “eye”) organizes building the “Millionaires Express” train linking Far Hills to Gladstone. Service from Hoboken began six months later! 1838 – Train Tidbit- Morristown to NY commences in Jan. 1838. Elizabethtown to Plainfield starts in 1839. Summit to Bernardsville via Passaic Valley & Peapack RR starts 33 years later. 1701 – The “Peapack Patent” of 1701 transferred lands from 24 proprietors of East Jersey to George Willocks and John Johnstone. 1600s – The Leni Lenape indian tribe that was in the Somerset Hills area in the 1600’s was classified as Algonquin, part of the Iroquois Nation. 1998 – Hamilton Farm in Bedminster, one of the largest working farms in New Jersey (Known also as the former Brady Estate) was sold in 1998 to the Beneficial Management Corporation. 1998 – December – Beneficial Management Corporation donates the US Equestrian Foundation its new headquarters in Gladstone, stables, and a four acre easement from the Hamilton Farm estate. 1749 – Bedminster Incorporates. In 1880, Bedminster’s population was 1,812, just 600 fewer than the population listed in the 1980 census. 1972 – The USGA buys its Golf House (once known as Dogwood) Museum from David M. Potter III in Far Hills, the former Frothingham/Sloan House, designed by John Russell Pope, who also designed the Jefferson Memorial, was once the estate home to Cyrus Vance, Secretary of State, who lived next door in a carriage house. 1926 – Thomas Frothingham’s Dogwood estate in Far Hills (now USGA Golf House Museum) was sold to John Sloan, due to bankruptcy as partner of investment company Potter Brothers & Company after a failed suicide attempt, a divorce from his wife, and moving to Mexico to avoid bankruptcy prosecution. He died in Mexico. 1946 – September 26 – Born: The great-grandniece of Grant B. Schley (Schley Mountain) is Christine Todd Whitman , Somerset Freeholder, NJ Governor, and EPA Secretary. 1919 – The Frothingham/Sloan House (USGA Museum) was constructed in 1919, built for Thomas Frothingham, and later sold (1926) to John Sloan, a prominent furniture retailer. 1972 – The Hills Development Company and Toll Brothers built the States largest residential development: 1,880 units in Bernards Twp. 3,200 in Bedminster (5,100 total), consisting of 610 Mt. Laurel units, single family homes and commercial sites on 1,500 acres over 20 years starting in 1972. 1972 – Did you know that Liberty Ridge, a section of The Hills Development in Basking Ridge and Bedminster, is named in memory of the Revolutionary War patriots who built the nation’s first artillery school on Schley Mountain, known also as the Pluckemin Artillery Encampment, the forerunner to the West Point Military Academy. 1956 – The same year Eisenhower signed Federal-Aid Highway Act to allow free movement of the military’s missile defense systems, New Jersey Legislators agreed to lobby the federal government for a north/south and east/west highway, and soon Routes 287 & 78 were added to the National System of Interstate and Defense Highways. The roads were completed in 1968 changing the Somerset Hills forever. 1974 – Starting in 1974, AT&T moved 6,300 employees to two large corporate parks, one in Bedminster at the foothills of Schley Mountain and another less than a mile away in Bernards. 1887 – Evander H. Schley’s brother, Grant, and his wife, Elizabeth, came by horse-drawn carriage to see Evander’s farms in Bernards and Bedminster. Elizabeth is said to have remarked on the beautiful vista of “far hills,” thus giving name to the place where there was yet no village. 1954 – Moorland Farms, home to the annual Far Hills Race Meeting, was originally called Froh-Heim (German for Happy Home) and owned by Charles Pfizer. At it’s heyday it was about a 3000 acre estate with a live-in staff of 36 servants. The film Madame Butterfly starring Mary Pickford was filmed here in 1915. The estate was renamed Moorland Farms by owner William Bassett in 1954. The property was purchased by AT&T in the 1980’s where the Moorland Farms is home to the Far Hills Race Meeting steeplechase and the charitable Midland Run. 1969 – The descendants of Grant Schley sold Schley Mountain for $2.2 million for development of what is now known as The Hills Development of Bedminster and Bernards Township. By the time construction began in earnest on the Bernards side in the mid-1990s, Johns-Manville hadsold its 50 percent share to William E. Simon and Sons. This group, in turn, auctioned off huge parcels to major home builders like K. Hovnanian, Pulte Homes and Toll Brothers. 1924 – Bernardsville (named in 1924) is the only town in the United States with the unique name Bernardsville. 1910 – February 10 – The First Farmers Day celebration is sponsored by Charles Pfizer, and hosted by his hunt club, the Essex Fox Hounds to thank local farmers for use of their land draws 300 men. The Farmers Day was the precursor to today’s Far Hills Race Meeting. 1915 – October 23 – The New Jersey Hunt Cup and the Essex Hounds Club run its first official steeplechase. The next year the event moves to Froh-Heim in Far Hills, the estate of Grant Schley, which later becomes Moorland Farms. Now called The Far Hills Race Meeting, it is still held he last Saturday of every October, rain or shine. 1942 – August – The Hamilton Farm stables in Bedminster are converted from the first civilian base hospital for merchant marine seamen who had been torpedoed in World War II. 1912 – James Cox Brady named Hamilton Farm in Bedminster after his first wife Elizabeth Jane Hamilton. 1983 – King Hassan II of Morocco purchases the Natirar Estate in Peapack (Raritan spelled backwards) for $7.5 million, setting a record for a home purchase in New Jersey. 1933 – Upon Walter Graeme Ladd’s death of pneumonia on May 21, noted that after his wife Kate Macy’s death (1945) the Natirar Estate in Peapack would become a convalescent home for women until May 21, 1983 – 50 years from his death, which is why the estate was sold in 1983. 1910 – C. Ledyard Blair (Blairsden Estate in Peapack Today) served as Commodore of the prestigious New York Yacht Club. His 240 foot yacht The Diana, served as flagship. Historic Blairsden in Peapack Gladstone is open to the public from May 1 – 30, 2014 and is one of America’s greatest estates. 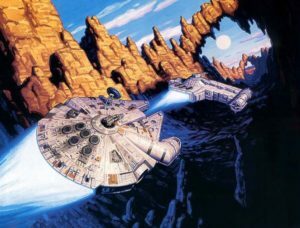 Over 62,000 square feet – the mountain was chopped by 15 feet to build the estate. 1760 – May 24 – Witnessed by Francis Bernard Esq, Charters the Township of Bernardston (Bernards Township) 246 years old in 2006 giving the right to choose a constable, oversee the poor, oversee the Highways, and to enjoy the rights, liberties, and immunities. 1951 – What was formerly the Blairsden (Peapack) stables, is sold to the Matheny School, (Walter and Marguerite Matheny founded in 1946) which is the present location for the Matheny Medical and Educational Center which focuses on children and adults cerebral palsy, muscular dystrophy, spina bifida. 1968 – John Jacob Astor Jr’s estate originally built by Samuel Owen (1912), was once an apple and peach fruit orchard farm. 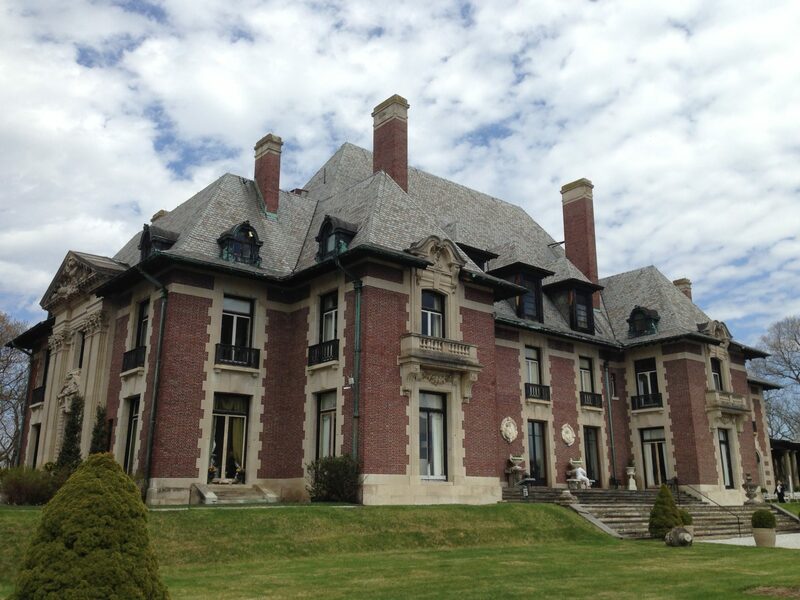 The hilltop home and 28 acres were purchased from John Jacob Astor 6th by Bernards Township in 1968 for $140,000. 1931 – Tommy Dorsey – The Sentimental Gentleman of Swing, purchases the red brick Tall Oaks estate in Bernardsville and lives there until 1941. 1733 – The name “Basking Ridge” first appeared in the records of the Basking Ridge Presbyterian Church in 1733. The writer noted that wild animals from the surrounding lowlands would bask in the sunlight on the ridge. At that time, the church was a log cabin on what is now East Oak Street. 1912 – April 14, 1912, Colonel John Jacob Astor IV, who lived in what is today the Bernards Township Administration Building, perished in the sinking of the Titanic. 1,523 people perished in the accident. Robert Field Stockton , also known as Commodore Stockton, was a hero of the Mexican War who was instrumental in bringing the state of California into the Union in 1850, was a student at the Brick Academy until he was expelled for mischievous conduct. Brick Academy (The Classical School) in Basking Ridge has a long list of eminent graduates including names as; Dr. Jacob Kirkpatrick, Dr. Philip Lindsley, Samuel Lewis Southard as well as; Alward, Breese, Boylan, Annin, Ayers, Cross, Dayton, Conklin, Doty, Hall, Guerin, Hill, Pennington, Lewis, Rickey, Vail, Whitaker, Winne and others. 1962 – The Gladstone Train Station freight house (to the west of the train station) was used in the film The Miracle Worker. 1845 – Grant Barney Schley, a founding father of Far Hills, was born in 1845 at Chapinville, N. Y., near Syracuse, to a farm family of humble circumstances. He obtained only an elementary school education. At the age of 16 he went to work for as a peach picker and shipping clerk for Wells, Butterfield and Company, a Syracuse firm which later merged with others (George F. Baker’s First National Bank) to become the American Express Company. 1967 – Declining school enrollment and rising educational costs led to the closing of the Far Hills School in 1967. It was a decision painfully reached and sharply opposed by local families who had sent three generations of children to the village school. The borough’s 80 kindergarten through 8th grade students began attending Bedminster School in the fall of 1967. 1971 – AT&T acquired 225 acres in Far Hills and an adjoining 140 acres in Bedminster, lands once part of Grant Schley’s Froh-Heim, and constructed a corporate headquarters for its Long Lines Division near the river in Bedminster. AT&T pledged to keep the Far Hills lands open space forever and to continue to make the race course available for the annual Far Hills Race Meeting. 1986 – In 1899, Evander Schley and David Dumont drew up a subdivision plan of the Dumont Farm and offered lots for sale in what was to become Far Hills village. A unique clause was written into each deed prohibiting the sale of alcoholic beverages on the premises. The voters and Borough Council rejected a proposal to permit sale of alcoholic beverages in the borough. It remains a dry borough today. 2010 – Simon Estes, a former Liberty Corner resident, a bass-baritone of international renown, Estes’ professional career in opera began in the opera houses of Germany and in 1965 he was a prize winner in the Munich international competition. In 1966 he won the silver medal in the Tchaikovsky competition in Moscow. In addition to his operatic career, in which he has sung more than 75 leading roles with the great opera companies of the world, Estes has been soloist with many symphony orchestras here and abroad. He performed at the 25th Anniversary Celebration of the founding of the United Nations and sang at the opening of the Olympic Games in Munich. It has been said that the horse head scene from ”The Godfather” took place originally on Hardscrabble Road in Bernardsville. 1869 – The Liberty Corner Presbyterian church that stands today was built in 1869 buy James P. Goltra. The structure was the second for the congregation. Feel free to post one. Don’t forget to follow our This Day in History calendar. Click here or follow us on social media.